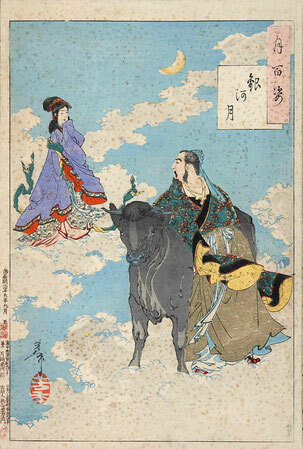 Once upon a time, in the world of stars, there was a loving couple, Princess Orihime (the weaver, Vega) and Hikoboshi (the cowherd, Altair). As they were madly in love, they became less productive with their work and Princess's father Tentei (Kind of stars) got angry and separated them by the Milky Way. But they were allowed to meet once a year by the bridge made by magpies over the Milky Way on the 7th July. If it is a clear day, we may perhaps see their encounter on the summer sky…. I am a romantic being and love this story. Perhaps you can hold hands together with your loved one and appreciate the moment they can be together. Here is a ritual accompanied with this folk tale. 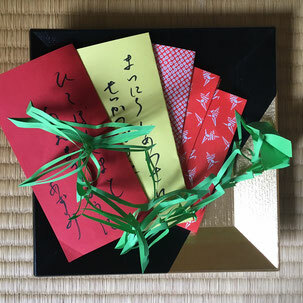 In the ancient Japan, the ladies were making an offering and write a wish to improve the skills for "weaving" on the 7th July, related to Shinto tradition. Later the wishes were made for all kinds of skills to improve, and any other wishes in life and the wishes were written in a form of poem on colored paper. "Tanzaku". In modern days. 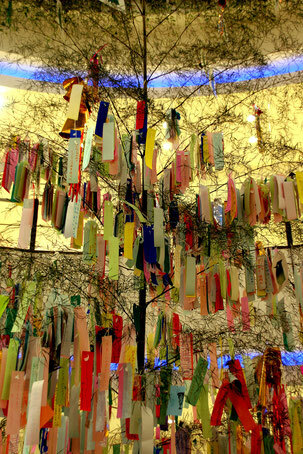 people put "Tanzaku" onto the branches bamboo trees, the symbol of strength, together with beautiful paper decorations. In the evening, we wear Yukata, summer cotton kimono and enjoy the evening with the decorated bamboo trees with summer dishes such as ice cold Somen noodles.Even in this modern Japan, we practice our ancient daily and seasonal rituals and celebrate the seasonal event with festivals, rooted in the principle of Shinto and Buddhism, not as a religion, but as a philosophy of life. To create the harmony within ourselves, with nature and with our surrounding is the unspoken law of the Japanese society. I love these moments given to think what we wish or what we want to achieve in life. 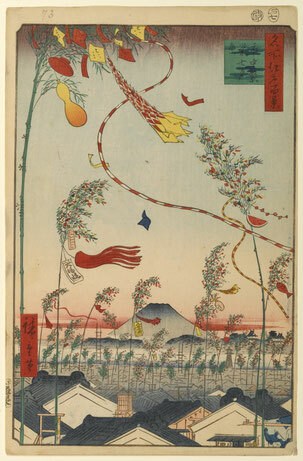 My summer started with "Tanabata" festival on the 7 July. 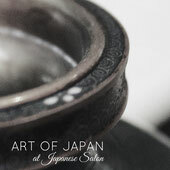 If you wish to learn more about the art of Japanese rituals, traditions, contact.